Being a working mom, I love fast and easy meals. I love them even more when they are also delicious and healthy to boot. This is one of them. It is tried and tested, and this is really a 30-minute meal. It’s true. I timed it. Several shortcuts were used, but that is ok. That is why they are called short cuts, they cut short the time spent in the kitchen so you can get on with the many other duties in life. 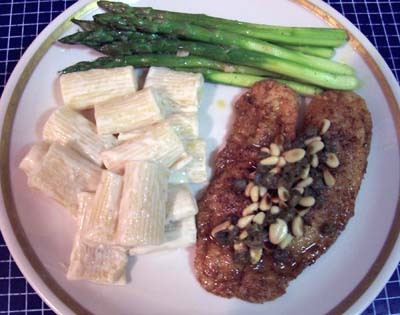 The tilapia parmesan recipe has been posted before, and I am not too sure about the asparagus. The asparagus is simply sauteed in olive oil and garlic for exactly three minutes to retain their crispness. The pasta is simply sauced with store-bought, alfredo sauce in a jar. When you have a dinner like this in your repertoir, last minute PTA meetings, band concerts, swim class, and the like are all doable. hi anon, sorry for the late reply. The recipe is here.